Do your students or children use individual vocabulary or spelling lists? 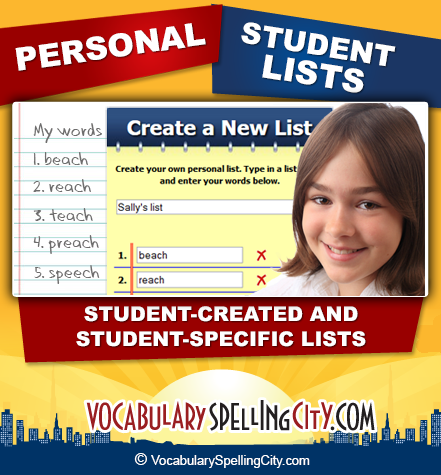 VocabularySpellingCity’s Student Lists feature makes it easy for teachers to differentiate instruction and parents to personalize learning. Student Lists can be used with all of our learning games and activities. Student Lists is a Premium Membership feature, so all student activity will be recorded. Student-Specific Lists are lists assigned by teachers and parents to individual students to target instruction. Student-Created Lists are lists entered and saved by the students themselves. Student-Created Lists may be imported by the teacher to be edited or shared with other students.